I have heard and read a lot about the so-called psychic or paranormal abilities Yowie's have...Ok lets start from the beginning . The Aboringinals believe there some spirital connection or voodoo type energy surrounding Yowies. In their culture which was passed from generation 2 generation with the limited technology and thinking that they had, back then if the elders couldn't explain it they put a spiritual connection to it. Basically it was a no no or bad karma to see 1 or come into contact with 1. Our info on Yowie's now is expanding on daily basis for Australia's the top of line predator, it has proven on many times that it has exceptional abilities in camouflage, stealth, being to move without virtually no sound even for size they attain, and they were taught this as soon as they could walk, all military special forces units worldwide would die to be able equal their ablities, they the Yowies have doing this for hundreds of years. Then with the arrival of white settlers, we are now every day expanding into their turf and they don't like we are a threat, this so-called psychic behavior is a misconception, have you ever the words "LEARN'T BEHAVIOR", they watch, listen, eat our food and as time goes by this becomes a new skill, do you what that new skill is...NO FEAR, they don't fear us they are wary of us, we fear them...so when someone says that they couldn't scare the hairy man off or he won't leave you alone at night and keeps harassing you at home that borders bush, his home is because he's not scared of YOU he's not psychic but he knows how to make you sweat and he smells that in us just a dog knows when u are scared, what we are dealing with is a top of the food chain predator whose skill and abilities have lasted him this long and well into the future, some experts think like me that this what Yowie's are and some are caught in the phantom psychic paranormal event saying Yowies are part flesh and part spirit, I'm sorry but eventually we are going to get the footage, photo's and physical evidence 2 prove once and for all that they exist. The Aboringinals believe there some spirital connection or voodoo type energy surrounding Yowies. And after 40,000 years..of being here...they just might have had a rough idea there was something odd with this animal..
And what other normal..flesh and blood animals other than the yowie...did the aboriginals believe had this spirital connection or voodoo type energy ?? But we will ignore their time here..and time in the bush dealing with all sorts of animals.. In their culture which was passed from generation 2 generation with the limited technology and thinking that they had, back then if the elders couldn't explain it they put a spiritual connection to it. Its a tad odd that they couldnt explain a normal animal...but we will ignore that as well..
What "info" are you talking about.??? the Yowies have doing this for hundreds of years. How did you work out this rough time factor.? psychic behavior is a misconception, have you ever the words "LEARN'T BEHAVIOR"
Yes I have heard the term....but it has diddly squat to do with the phenomena. The elephant in the room is this....if i told you there were monsterous sized animals that were undiscovered in 1 country...you might believe me..if I told you several countries had the same sort of animals, eg,morphological traits..and they were undiscovered as well..you might say "maybe"..but then what if i also said heaps of countries had the the same sorts of reported monsterous bipedal ape like things ..that were "undiscovered"...then you would...correctly..be highly sceptical. But the majority of flesh and blood advocates ignore this major connundrum. No big deal..they ignore all the other problems as well....and blunder onward anyway. The ape like monsterous forms are popping up in the UK now for gods sake. The whole yowies/sasquatch/yetis etc are really good at hiding "argument" falls apart when the multiplicity of reports/locations are taken into account. And..other than the yowie/sasquatch/yeti type animals.....what other monsterous sized animal...having the same rough body shape in multiple countries.... cannot be killed/caught...ever.. So...Its really good at "hiding from us"...which means its a top of the food chain predator ? Because other than an ability to hide really well...I dont know of any evidence that yowies are a top of the food chain predator. Can you show us at any evidence please.? If you ignore paranormal reports/aspects both from here and the US..and ignore all the "minor" problems like zero fossil lines...and...ignore the lack of physical evidence other than some bits of plaster and hair...and ignore the lack of evidence for any ability of yowies to build anything.....that was not outside the abilities of a chimp. And ignore the variations in foot shapes..from even close locations...and ignore the actually ridiculous shapes of some of the prints...and ignore the lack of structural integrity of some of the foot shapes for supporting a great weight..
50 years ago the cry was "we will get the evidence"....now the cry is still "we are going to get the evidence...one day"
And in 50 years time people will still be waiting..
Homerbear your entitled you’re your flesh and blood theory….that is after all what this forum is about to share and collaborate our ideas and theories. But I would have to disagree with some of the things you said. I do not believe the aborigines where limited thinkers like what has been suggested they did after all live with these creatures for millennia they probably lived with these creatures more so than what we humans do now. (Living off the land out in the bush etc). Their knowledge of the yowie is second to none. The yowie is not a top of the line predator that ‘does not fear us’ in fact in most cases they will run/walk away at first sight of a human, in other cases they are curious and playful and then in other cases they can sometimes be aggressive. Yowies have different personality traits just like we humans do they are not all one and the same. The flesh and blood vs. the paranormal debate will always attract following of people who are sure their right, but the matter is no one can actually say they know the truth. I guess it comes from years of experience and the ones with the most experience are the ‘aborigines’ of the world. I have been on the receiving end of 'mental slaps' many times from them during encounters. It is not natural, nor a figment of imagination. It is very real. Thus the statements of hundreds witnesses that feel them in some capacity prior to their sightings. (Feelings of being watched etc). Not all aboriginals claim they are spirits. Some say they are flesh and blood, while others claim they are not, depending on the individual. In all life, whether animal or Human, we have a spirit and for some reason, differing personalities can use their spiritual intellect far greater than others. The Yowie does not have fast food or television to occupy their mind space, therefore it is reasonable to assume they manage their minds and spiritual energy better than we. Dean don't get wrong, but seriously this is the first I heard and I think everyone else has heard this or read about this unusual event that's happened to you. So my question to you why have you kept this critical info from the other researchers on this site, are somewhat sceptical about your thoughts on this subject? So Dean are you suggesting that yowies are more intelligent than humans, because if that is so because they don't have fast food or tv's to bore themselves with how is it when the fisrt explorers came to Australia they met Aboringinals and not yowies? The reason that the first explorers met aboriginals and not yowies..according to flesh and blood hand book..page 45 ..because yowies were really good at hiding then...as they are now..and there was more aboriginals than yowies. Possibly because he had the crazy idea that people who do their "research" for 10 minutes on the net on unusual subjects..and who appear to know absolutely nothing about the phenomena and have read very little...would be sarcastic smart arses when he told the truth..!! are somewhat sceptical about your thoughts on this subject? Mate...not sure what this is trying to say..but i will have a stab..you and ? are sceptical of Deans and other eyewitnesses claims. I don’t believe there is any just cause for anyone to speak harshly, we’re all friends here and I hope it remains this way. Everyone is entitled to their own opinion and mine just so happens to be based on my experience, yet have normally been reluctant to speak about publically and still don't feel very comfortable about it. I have experienced certain unexplainable events, and 90% of our witnesses have also, which is a statistic ignorant to dismiss. Not only do Humans experience this “Nameless Dread” which is well documented, but also animals. When there is one in the area, not only do Humans and Animals become affected, but also insects. The entire area can be teaming with life, animals such as birds, wallabies, cane toads, cicadas, crickets and then within seconds everything changes. It becomes deathly quiet, not a creature stirs and there is an ungodly sensation in the air that is like ice. Goose bumps appear on your arms and the hair raises on the back of your neck. Then it arrives, lurking in the bushes…….. Same is common in most reports where the witnesses tell of a feelings of being watched, a sensation of dread, a sudden feeling of vulnerability for no apparent reason. Then the sighting/encounter begins. Pets can also begin to behave strangely prior to activity. Not endorsing this, however there are a lot of people who claim to have seen them vanish or have them walk around them with no form. I know two people who say they were forced off a cliff when being chased by ‘footsteps’ in the grass and they spent 3 weeks in Hospital. Yes that all sounds a little heavy to swallow, but it’s a common World Wide phenomena whether people like hearing it or not. A friend of mine had one walking around his car, but he couldn’t see it. While on expedition we had something approximate estimate from the weight – 200kg on two feet, walk heavily all the way up a side of a hill to within 5m of us. When it arrived we turned on the spotlights, not a sound and there was nothing to be seen. I can’t explain that. It was an event that totally bewilders me. The last foot fell within milliseconds of pressing the button only a few metres from where we stood. Why is there no physical evidence other than sightings, plaster casts and foliage damage? Having witnessed the speed and strength during some nights in the field, perhaps I can see why….. Far too large and powerful, with abilities beyond ours for us to bring one down. I doubt a normal gun would have stopped the one that chased me in Ormeau. The only aspect that I believe saved me was the fact that I had the head start to an open field and eventually a street light. When he was stalking me, I at first thought it was a Human and paid little mind, in fact I was looking forward to some games, but then my body suddenly locked totally paralysed and I have unearthly chills all over my body that were not natural. It was at that point I knew there was something very wrong and certainly not normal. When he was chasing me, it’s hard to explain unless you have experienced it, however the feelings being projected absorbed me. There was such anger. If indeed they do have some form of psychic capacity greater than ours, they may have the ability to pick up on mind energy, thus the outcome of a study we conducted three years ago which concluded a very large percentage of people who have had encounters either had mental/physical pain or were doing something a little naughty at the time, thus heightening their mind energy. I know this also happened to me on a few occasions. I know a lot of people that use mind energy to attract them, including Aboriginals. Same in return, this mind energy (or whatever people would prefer to call it), if being far greater than ours, could, just could be, how they can project this Nameless Dread upon everything surrounding them, if they wish. I recall (as some of you all may also), while on Expedition at Kilkivan. Myself, Brett Green, Mick Dale and Trevor were at base when an Elephant on two legs steamrolled through the forest smashing down tree’s on the other side of the creek. I asked the others to keep talking and act natural, while I go and get the footage. I was determined, very confident and feeling bullet proof. I raced down the creek and quick as I could, extremely excited. The moment I stepped up onto that bank, I hit a wall of ice that not only shut ME down, but also every living animal around me also. I was determined not to let it win, so I continued on step by step. I became nauseous, sweating, shaking, goose bumps, cold and hair on end. Every step I placed made me more and more ill until finally I dropped to the ground and couldn’t move. I evaluated myself throughly many times, and it was not a fear or sickness coming from with in. It was more like being somehow riddled with negative external energy like a force field (that’s the only way I can put it). I knew it was right there somewhere and the Dread was flowing through my veins. It wasn’t until 4 minutes later I could begin to move. Right at that point all the animals and bugs became alive and definitelynoisy again. Now I could move again, I checked every tree, rock and hiding place, but it was gone. Without a sound. Something that large in dense dry foliage and dry leafy ground, to vanish without breaking a twig was extraordinary to say the least. I do know that from my very own experiences at least, that there is most certainly an ability or as I have said, an energy, to them that we can’t quite explain and there is no ignoring or escaping it. It’s a World Wide trait that most researchers accept these days. Always best to keep an open mind, after all, Yowies don’t exist either, right? What about a group hug and drinks..on you.. It cannot work out here for either of us.. if you continue being as sensitive as you have been and refuse to accept what I consider as constructive criticism. Thanks for your input...and good luck somewhere else..
After reading the original discussion thread on this topic I was a little bemused to see that the subject had been locked after a few heated exchanges between members. I'm actually surprised to see that the subject is now "un-locked". I can understand why this occurred (because I read the original comments) however I don't think locking a subject is the most productive reaction to have, primarily because it excludes anyone else from adding thought to a active discussion. After all, the best thing about this thread are the comments from Dean which are highly enlightening and may never have been posted if this discussion hadn't been started. Regardless of how disagreeable some people's comments are, at the very least they will provoke a reaction from more experienced members and for me that is perhaps the most interesting aspect of these discussions. While I'm glad to see that this subject is now open for further comment I think the initial spark has been lost. It's also alarming to note that since this subject has been "un-locked" it is evident that certain posts have been deleted and some comments have been edited. Right or wrong, if a discussion thread is posted I feel it should at least be presented to other readers in its original form and free from a retrospective editing process if the integrity of this forum is to be maintained. It also seems that while writing this homebear has had the fortitude to come forward with an appology (which takes guts - even over the internet) and clarify his position on a few points. Well done homebear. I'm glad this thread was "un-locked" so you had the opportunity. In no way do I regard the performer Derren Brown, a 'psychic', yet he has demonstrated through hypnosis how a person can be made 'invisible' to another person (many hypnotists have demonstrated this feat). Is this not similar to what our yowie seems to be able to do? Have you ever 'felt' someone looking at you or standing right behind you and lo and behold, a person was doing exactly that. Is this not similar to what our yowie seems to be able to do but in more dramatic fashion? joe wrote: In no way do I regard the performer Derren Brown, a 'psychic', yet he has demonstrated through hypnosis how a person can be made 'invisible' to another person (many hypnotists have demonstrated this feat). Is this not similar to what our yowie seems to be able to do? Have you ever 'felt' someone looking at you or standing right behind you and lo and behold, a person was doing exactly that. Is this not similar to what our yowie seems to be able to do but in more dramatic fashion? Interesting thought there too and that could be possible! Now I believe in a lot of things on the spiritual side but personally I would think heavily on instinct. But in saying that what is instinct? is it an intelligent thing passed on from generation to the next like some kind of code in our genes or is it that other stuff we can't explain that might just be in the psychic bag? is it smelling the chemicals living things let off when ever we have an emotional change? like animals smelling fear? Instinct tends to be believed as a learning habit but they can't explain why a person may feel uneasy all of a sudden and panic and even more so in the middle of no-where where there is no heavy if at all electrical currents to set off a fear feeling or sickness, no reason to be otherwise suddenly alarmed. This is unfounded fear all of a sudden people describe (well founded once they have seen it eh? ). I think to believe these creatures have a psychic side comes down to if you believe in that side full stop with humans and such. If you don't believe in it well of course your not going to believe anything else has it yeah? If you don’t want to be a homer – bear with me! Being on side with members of the board and particularly moderators, is achievable. Firstly, avoid trying to pass your opinions off as facts. It will naturally attract criticism with open arms & you’ll have only yourself to blame. The remedy is if you are sharing your own personal theory or the theory of another person, announce it as such. Secondly, choose your words carefully when disagreeing or upset with another’s comments. Luckily, a post made in haste before your passion has cooled, is easy to edit due to the wizards behind this board. They had the good foresight to include the EDIT feature to help keep the boards as civil as possible. Use it! I want to believe it isn’t necessary, but it is!! We’re only human, not psychic endowed yowies! Alternatively, a post which contains a veiled physical threat towards another, will naturally be taken seriously. The remedy is keep your emotions in check and any needs to increase Yowie knowledge will be duly accommodated here. Thank you Joe. My intended post is now uneeded. As previously stated, we are all friends and everyone is welcome. Opinions are accepted. We have a great family and group of thinkers here, of which we all enjoy. I myself did not personally block nor remove any posts. Homerbear, keep your thoughts flowing. I accept your apology for threatening me.. !! They were not "negative" comments..the board is here for peoples ideas/opinions..I merely disagreed with your views..and pointed out the weaknesses in each statement I thought appeared illogical..to me at least. At no stage did I mean any offence to you..
Can you match that..??? LOL. Sure..I will be less critical..in a positive sense. homerbear wrote: The Aboringinals believe there some spirital connection or voodoo type energy surrounding Yowies. Now, that's interesting. As Dean stated, it would explain why so many people feel they're "being watched". But also a lot of reports say that the environment goes very silent. Crickets stop chirping etc. Maybe other life forms sense this energy as well? First time i've read this post. The mention of Derren Brown made me think of this. Ever thought that's why they observe for so long? They're doing their own version of cold reading! They know their own surroundings 100% more than you. You walk into unfamiliar territory, you have no idea what you're up against.. all the while the Yowie is checking you out. Reading you. So it can determine if you're a threat or not. From there it goes on what it knows about you, without you even knowing it. I've taught myself a slight amount of cold reading - not nearly as much as most, but I've been told by a lot of people "how did you know that?! I didn't even tell you that!" If I can do it, why can't they? Can't really answer that one Homebear except to say I don't think you're wasting your time. The only suggestion I could make is that people's opinions on Yowies seem to drastically change once they've had an encounter. Maybe after spending countless hours of effort trying to obtain video footage of a Yowie your own understanding of them evolves to a point where you no longer feel it's right to share that information with the masses. I see your point regarding the apparent lack of evidence that is put forward by researchers and it's hard to get your head around the fact that most physical evidence that is publically presented consists of plaster casts and photos of footprints that are so widely inconsistent as to be almost detrimental. It's even more frustrating when you think the most compelling video is still the Patterson footage from 40 odd years ago and even that is heavily debated in terms of authenticity. Personally I tend to agree that there is better evidence out there but for whatever reason it's held close to the chest. I mean, on this forum alone there have been references made to "face to face" encounters at Mt Kembla, how Steve had the drop on a Yowie with a shotgun and some other little gems that drop out of the air throughout some of the discussion threads. The only thing I can conclude is that if the information isn't being shared it's for a good reason that is probably beyond us. If I devoted the same amount of time and resources that Dean has to Yowie research I might be a little protective of the information I gathered, but what would be the point? All I can say is if there is better evidence I'm sure it will emerge when the time is right. The thing that drives me is that people are still reporting sightings and are still collecting evidence (footprints, tree bites, rock formations, stick formations, tree bends etc) but the most compelling evidence for myself are the people close to me who have seen these things. A friend of mine had two encounters with Yowies near Bodalla on the NSW south coast (once in company with her father) and for me her testimony is the best evidence. Now I just need to get out and find one. Don't get me wrong Homebear. There is nothing I would love more than to see conclusive evidence that Yowies exist but I think that will always be the carrot dangled in front of the donkey. To me I think the only conclusive evidence you will ever get is to see one with your own two eyes and that's why I don't think you're wasting your time. iwanttobelieve wrote: A friend of mine had two encounters with Yowies near Bodalla on the NSW south coast (once in company with her father) and for me her testimony is the best evidence. Oh I was down there last week, I took a week off with the gf, hired a car and drove all the coast from syd to melb and back via hume. We hit a bunch of trails like upto Brooman (spooky! ), out to Eurobodalla, Mumbulla Mt, and through Yowrie itself into the wadbilliga NP. Would love to hear more cos I'm lookin to rent then buy in the area. There were plenty of places where we got some funny vibes. Good to see you're keen on living on the south coast. I used to sell property in the Moruya region when I lived there and it's a great place. People are nice, the fishing's good and it's relatively quiet and untouched. Last time I visited there were quite a few Yogies getting about but that's usually just on the weekend (a Yogie is what south coast locals call visitors from Canberra. Don't ask me why but I think it's because all their licence plates start with "Y". Go figure). I'll try to find the exact locations of those sightings if you like but they were in the Bodalla to Cobargo region. Once was at a fishing spot where her Dad used to take her. I've been there once myself many years ago but my memory fails me as to the exact location. I'm pretty sure we had to access it through someone's property and it was in an area known as Digman’s Creek. After finding this site and reading about eye witness reports I asked her to tell me what she saw. The eerie thing is that she had absolutely no familiarity with this site or had read anything about Yowies but her account of what happened was so similar to many of the reports you read about. I still remember getting goose bumps when hearing her first-hand account. I showed her this site and she was amazed at how many reports echoed her own experience. She was about 11 years old and her Dad took her fishing to this spot. She's one of those "arty" people and has been singing and painting since she was a kid. While her Dad was fishing she went into the bush to build a cubby house and was singing to herself (a habit she still has). Anyway, after a while it started to get late in the afternoon and she had a feeling of being watched. She turned around and there was a Yowie about 30 metres away just looking at her. She let out an involuntary squeal and the Yowie stood up, turned and “scampered” up the hill. She was shocked but didn’t feel threatened at all and just had a feeling that the Yowie was curious of her (maybe because she was singing) and had been quietly watching. Her initial description to her Dad was that it looked like a big, hairy Aboriginal with big yellow eyes. Her account is probably what got me really hooked on Yowies. The thing is she has also had other "spiritual" encounters through her life so I've often wondered if anyone can see a Yowie or do you need to be on a different level to sense these things? Tony Healy conducted a video interview about the account when he was up here. I’ve got a copy of it and would love to post it but I’m not sure how. It’s a very large video file and I’m not a techno whiz so I’m unsure how to compress it so the file size is more manageable. Maybe Cass or Deadpool can give me some tips on how to load it onto the multi-media section or something? Dean Harrison wrote: I don’t believe there is any just cause for anyone to speak harshly, we’re all friends here and I hope it remains this way. Everyone is entitled to their own opinion and mine just so happens to be based on my experience, yet have normally been reluctant to speak about publically and still don't feel very comfortable about it. Dean, I replied to the my introduction thread but I will bring it up here rather. And your post is an awesome and almost perfect write up on something that the animal world has been using almost it's entire multi-celled existence. I know here in NZ there is nothing close to a Yowie. Yet when I stand out on my deck out night sometimes you can hear all the night life going beserk. Then it all goes quite and many wierd feelings start occuring to me. The valley I over look is filled with houses and trees and what not. The house is also on the side of a dormant volcano. Although a small one. I have been out in other parts of NZ and never ever heard the "Nameless Dread" ever. I bet if I forked out for the equipment you would find the volcano is oozing infrasound. I have also had "nameless dread" come upon me and the surrounding animal life during the day. And the only other times in my life where I have experienced this was when an apex predator would arrive on scene in the parks I used to frequent. This is the wiki page on it. The way I seen it all the reports of the bipedal's around the world describe and very similar beaing. And the have HUGE deep chests. More then enough room to vibrate a diaphram or vocal chord at a lower frequency range. Inaudible to the nake ear but animals can here it. And it short circuits the hell out of our brains. I just realised the doco I was thinking of was for Nat Geo where they played a tigers roar to an audience twice. One time with the infrasound and other with out. The original roar had a more "authentic" feel to it and came across as more threatening then the one with out the infrasound. The doco still has a lot of info about infrasound in it though (and a soundtrack with Sigur Ros). The inevitability of its doom is apparent to me now as a consequence of the imperfection inherent in every human being. Thanks for that info iwanttobelieve, I'd wager that spot is Dignam's Creek, and that is amazing because it's precisely the locality where I want to live! Between Central Tilba and Cobargo, but preferably the Tilba end, near Dignam's. If you know any folks still in the real estate game there I'm looking to rent, but not for another 6 - 12 months, then to buy. This is why I started hitting sites like this again actually, because I always knew the area was a Yowie hotspot. Now I know it's REALLY hot! Shar*Chi wrote: Thanks for that info iwanttobelieve, I'd wager that spot is Dignam's Creek, and that is amazing because it's precisely the locality where I want to live! Between Central Tilba and Cobargo, but preferably the Tilba end, near Dignam's. If you know any folks still in the real estate game there I'm looking to rent, but not for another 6 - 12 months, then to buy. This is why I started hitting sites like this again actually, because I always knew the area was a Yowie hotspot. Now I know it's REALLY hot! The whole south coast is a Yowie hot spot and Dignam's Creek is a hot spot within a hot spot. I was never fortunate enough to stumble across a Yowie myself which is just as well because I didn't really know what they were back then. I plan to get back to Moruya and take a trip to Tilba and Cobargo in a month or so. Hopefully I'll get a chance to go bush, put out a vibe and see if anyone wants to say g'day. The south coast is full of people with good vibes and I've often wondered if that's why Yowies are spotted so frequently. Maybe they're in tune with one another. While I lean to the F&B hypothesis I certainly believe they have a paranormal side to them, which comes first? As has been stated F&B with P or P with F&B? I’m not too sure we will ever know. Sightings indicate that they are physically present beings; you only need to read reports to know that they are physically seen! They have also been seen to eat, move and interact with physical objects, catch prey, why would something purely Paranormal need to eat and catch prey, they are known to have offspring, forgive me here but to my knowledge the only way to have offspring is through physical interaction. So what comes next? How do you define something which has never been proven to exist to be purely F&B or Paranormal for that matter? In my book you can’t, you can only learn from experience and by doing your research. Well to be a good researcher I believe one does need to look at the paranormal aspects of yowies/sasquatch. I know a lot of it is hard to swallow at times but if you care to look and listen you find these gems of stories pop up time and again. I find some accounts of stories fascinating; take for example the story of Jerry and Sue O’Connor who had a telepathic connection with a Yowie on 31 of October 2000. While I don’t know these people personally I believe them to be honest and credible witnesses. Its not the first time this telepathic link has come up, a lot of encounters/eyewitnesses say they (Yowies/sasquatch) knew my every move, it’s like they could read my mind. The strong feeling of being watched is all too common; the nameless dread which comes over people. What animal is able to project these feelings on to a person none that I’m aware of, is it just part of peoples imagination? To think that way you would have to discredit thousands of people. I have heard stories of Yowies being heard to pass by individuals no more than a couple of metres away in the bush but nothing was seen it was just felt? And heard? As if an invisible force passed them by. The aborigines speak of a spiritual being not all say they are supernatural some say they are pure F&B. There are also numerus accounts of Sasquatch being shot at only for them to disappear in the blink of an eye or for people to see them vanish for no apparent reason. Then you have the footsteps which mysteriously disappear as if something just took of in flight or dropped from the sky. The fact we get 3,4,5 and even 6 toed prints found worldwide suggests something strange is at foot, with no physical body it makes it quite hard for me personally to sit on Just the F&B side of the fence and like I say some of that comes from my own experience. 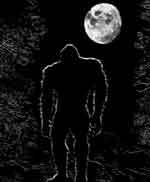 A good book to read is “The path of the skinwalker” It talks of a Bigfoot creature that was seen to come out of a portal in thin air the guy goes on to describe he was able to see another sky through it. It also speaks of a Bigfoot like creature in a transparent like form to be seen running across a field only to come to a halt and scream in some guys face. Although these stories may seem ridiculous, the paranormal aspect of Yowies/Sasquatch pops up time and again. While I lean towards the F&B I know there is something more to this than meets the eye. I believe there could be an inter dimensional ability to them and I say that because of my own experience where I was subjected to intense feelings but was unable to see the creature as if it was invisible and that’s hard to talk about it was only after these intense feelings that I saw him. Also we have no body to date, no bones just thousands upon thousands of eyewitness reports world wide. A good indication to the amount of sightings we do get is to download the BFRO’s google maps sighting data base there you will get an understanding of the amount of sightings that are to be seen. How come we get all these sightings but yet there is no evidence of a body. Where do they go when they die? How come no body has been found? Do they bury there dead? Why has no grave been found? A possible explanation is they die elsewhere on another plane of existence that would explain why no body has ever been found. Sounds stupid doesn’t it but at least I am willing think outside the square the mere fact we do get paranormal reports should suggest something’s going on. So going off of everything I have said I believe them to be F&B but with paranormal aspects. The psychic ness and the possible ability to transverse dimensions is a very real one and is something I am still trying to get my head around. Thats a great read Joe. I am a F&B person myself but after reading that came away with the posibility that a spirit form of them may exist. After having experiences with ghosts in this world, is it not possible that there are spirit forms of Yowies haunting a forest too? Though still a F&B person, I do not discount the possibility of Yowie ghosts and some experiences people have had do suggest a paranormal personality rather than a large biped lumbering around in the dark. I would rather run into the F&B version though, than have an invisble huge thing come hurtling down a hill towards me. Would be an interesting thing to get video of a spirit form yowie though. Let the skeptic move in their smaller world - before I knew I did not have a clue. Well, after thoroughly reading all the posts here, I have to say I'd not really thought about whether Yowies are flesh and blood or some other kind of phenomena... until now. If it were a purely spirit creature, it wouldn't need to build nests, pile sticks, break trees, and leave physical signs of depredation on other animals/physical objects (tree bites etc). Maybe, old Yowies 'die' but still have a spiritual form? If they are as long lived as the aborigines say they are, why not? I believe in ghosts, as I've lived in a home with one for 15 years. Why not believe our Yowie friends too, have a spiritual power, whether alive or dead? Thanks for starting this thread, it has really made me think a bit about this area, and I'm sure it has done the same for others reading it.